Salmon River–salmon fishing over the past week has been disappointing to say the least. Earlier in the week, Conditions were starting to look promising. We had salmon staging in the estuary and little pushes of fish each morning. This activity quickly died out earlier this week. As of now there are conflicting reports about salmon staging in the estuary, not sure what story to believe. We are back to covering a lot of water for a bite or two in the lower river. The Salmon fishing is definitely not as it should be for this Time of the a year. I think as many Coco salmon have come in to the river as Chinook salmon. The Coho Salmon are moving through the river so fast that they hardly taking time to stop and bite a fly. The fly zones for now are the only saving grace. Salmon are starting to concentrate in the main pools of both the upper and lower fly-fishing zones. Along with the salmon, there is an occasional steelhead being hooked. As for steelhead, we are starting to see a few more fish each day, Still not a lot of fish but if a few. The good news is that reports coming from the lake are still positive. Looks like we are dealing with grumpy and stubborn salmon, nothing that we have not experienced before. As always conditions can in will change quickly. Water flows for now remain at a constant 335 CFS. Hopefully the rains that are predicted for this coming week come through. We can definitely use some wet weather. Our productive flies have not changed much this past week. We are using wooly buggers, primarily in earth tone colors brown, copper, black, olive. Keep in mind it is more important to cover as much water efficiently as possible then the fly we are using at this time. When there is just a few fish in the system, we need to fish through as much prime fish holding water as possible. 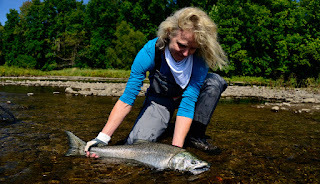 October dates 17, for both salmon fishing and steelhead fishing.